Cambell, Neil A., Jane B. Reece, Lawrence G. Mitchell. 1999. Biology, Fifth Ed. Benjamin Cummings, an imprint of Addison Wesley Longman, Inc. , Menlo Park, CA. Hardcover textbook. Approx. 1200 pages. 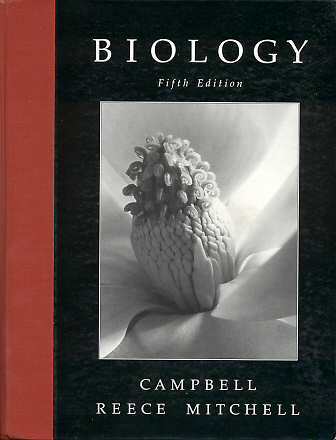 An excellent introductory college textbook, Biology is currently in its sixth edition. I used this text in two courses at the University of Alaska Anchorage and it covers the entire field in some detail with many superb color drawings and photographs. There is way too much material here for two semesters work, but the book continues to function as a basic reference covering many aspects of organismic, evolutionary, and molecular biology.